Do you want to know if Google has awarded your site with rich snippets? Great! This article will help you check and see if Google has awarded your site with enhanced search results. We’ll also teach you how you can monitor your site using Google Search Console. In this video, we’ll cover what rich snippets look like (so you know what to look for), how to check and see if your site has been awarded rich snippets using something called a “sitescope” and how to see if Google has visited your website. Hopefully you’ve had our app installed on your website for at least a couple of months. If you’ve only had the app installed on your store for a couple days or a week, you’ll need to wait for Google to crawl and index your website. How long does this take? There is no set amount of time for when this will take place. Google decides when to crawl and index your website. Google can take as soon as 3-12 weeks, but they can also take as long as 6 months as well (in rare cases). The important thing is to wait patiently and continue to work on improving your site’s SEO while you wait for Google to visit your site. Our app helps you become eligible for rich snippets, but unfortunately there is no way for us to force Google to give them to you. In the end, Google decides whether or not to award your site with enhanced search results (“rich snippets”). Google awards sites with great SEO. There is a way you can check to see if your site has been awarded rich snippets. You can perform something called a “sitescope” in Google. Make sure to replace ‘yourwebsite’ with your actual website URL. 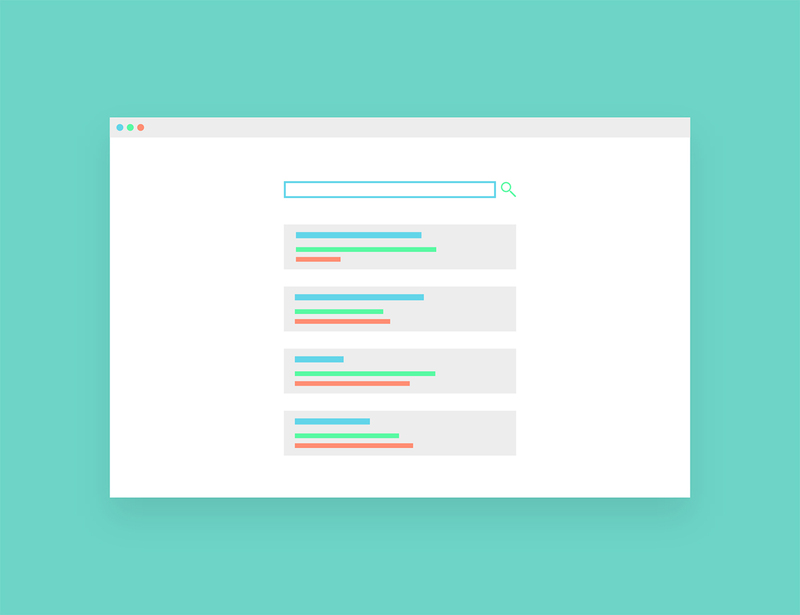 You should see a list of search results appearing that contain your website. Basically with a sitescope, you are telling Google “show me everything you can about my website on search results.” You might need to click on the 2nd, 3rd, or even 4th page of search results to see a rich snippet. In this example, we’re performing a sitescope on our website which is Adolab. Google has listed all of the relevant search results for our website which you can see listed below. What Does a Rich Snippet Look Like? If you don’t know what a rich snippet looks like, don’t worry. We’re going to cover what a rich snippet looks like so you can spot one for your own website! As you already know, a rich snippet is just an enhanced search result. Basically Google will show more information about your site in search results. There are many types of rich snippets, so we’ll cover five of the most common ones that you might encounter. A typical rich snippet will display pricing (ex: $120.oo) and availability (ex: “In stock”). 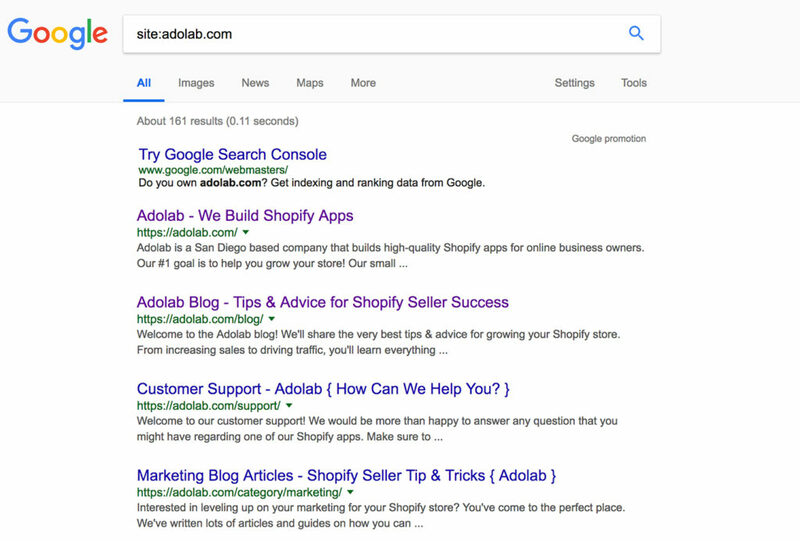 This type of rich snippet is great because it takes up more physical space on the search results page and stands out more. It instantly lets the shopper know the exact price of your product as well as if it is in stock or not. If your store doesn’t have reviews yet OR if you product doesn’t have a rating yet, Google will just display your product info. The portion outlined in red is the rich snippet. If you have reviews, Google can choose to also display your star ratings. If you don’t have reviews, then you won’t see a rating or stars. In this example, this store has lots of reviews so Google is displaying a very full rich snippet which includes: stars, rating, votes, pricing and availability. All of these items marked in red are examples of enhanced search results that offer more information to the shopper in search results. If you have written blog articles, Google can choose to display the data published field on search results. In this example below, you’ll see the date right next to our article description. The date field is an example of a rich snippet. Does your website have a lot of unique content? Hopefully you offer your customers a couple pages that offer information explicitly about your products and niche. These types of pages (called “corner stone content”) are essential for showing Google what your website is all about. Corner Stone Content is an important page on your website that targets a keyword or topic in great detail. In this example below, Skinny Teatox is a brand that sells tea to make you lose weight. In order to get this point across, they have pages on their website dedicated to the topic of tea. In other words, they are targeting the word “tea” to reach their market audience. Google will take notice if a website has a page on their website targeting a certain keyword. Google can then choose to make these important pages viewable in search results. The portion outlined in red is an example of a rich snippet displaying important website pages. This is the Cadillac of rich snippets. If your site has excellent SEO, Google can make your homepage appear quite large in search results. In this example below you’ll see that Death Wish Coffee has their website broken up into different clickable sections. Each section even has a small blurb to tell you a little bit about it so you can be enticed to click on it. The portion outlined in red is an example of a very robust and beautiful rich snippet. Keep in mind that Google doesn’t make these types of rich snippets for everyone …just websites with excellent SEO. Make sure to add lots of unique content to your website including blog articles, meta descriptions, product descriptions, and pages that explain what your company is all about. You might also want to work on creating back-links to show Google you’re legit and trustworthy. 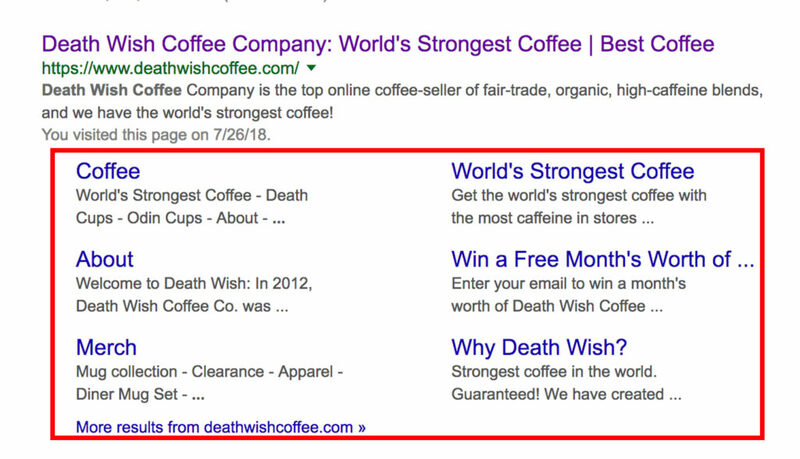 These are all do-able SEO improvements that Death Wish Coffee has undertaken to get to where they are today. Why am I not Seeing Rich Snippets? If you don’t see rich snippets yet this means that Google hasn’t awarded your site with them yet. Don’t worry, you’re still eligible for rich snippets! You’ll just need to wait longer for Google to crawl & index your site. It typically takes Google as soon as 3-12 weeks to crawl and index your website, but it can also take as long as 6 months (in rare cases). We recommend you wait patiently for Google to crawl and index your site. Another reason you might not be seeing any rich snippets is because your site could be lacking quality SEO. Our app works best with websites that are actively improving their SEO. You’ll need to put in the hard work and time to improve your site. If you’re looking for a place to start, check out our guide on how to optimize your product pages. Does your site have a custom domain? Does your site offer a way for customers to leave a product review? Are you actively encouraging customers to leave a review? Are your product descriptions more than 300 words in length? Have you written enticing meta-descriptions for all of your products? Whether you just installed our app or you’re waiting patiently for Google to award your site with rich snippets, we recommend that everyone register their site with Google Search Console. Google Search Console allows you to monitor when Google crawls and indexes your website. This is important because you can see if any action has happened yet. It is also a great tool for seeing if there are any errors or violations occurring within your website which can have a negative effect on your rich snippets. If something is wrong with your website, Google will let you know in your Google Search Console. Signing up for this account is a great step towards tracking your progress and keeping a close eye on what is actually happening with your online store. Instead of guessing if Google has crawled your website, this tool allows you to see if Google has actually visited your site and indexed your pages. It will also let you know which pages have been indexed and (again) if there were any problems or issues indexing your pages. Can I Speed Up The Process of Google Crawling & Indexing My Site? 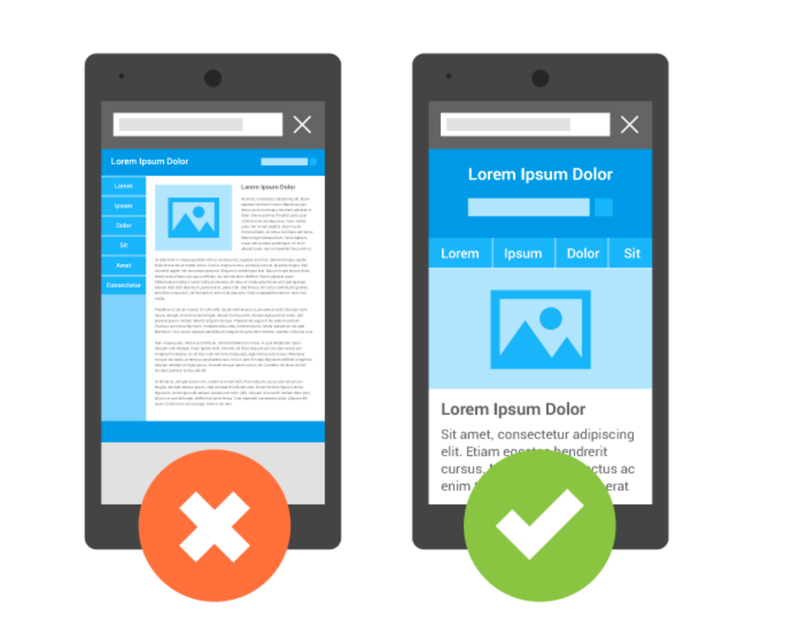 Unfortunately, there is no guaranteed way of forcing Google to crawl and index your website. Google decides when to visit your site and our app has no control over when they decide to do this. However, there is one way that you might be able to speed up the process of Google crawling and indexing your site. It’s not guaranteed, but it’s worth a try. You can submit your XML sitemap to Google. Remember that you’ll want to submit your XML sitemap link to Google Search Console, and not your HTML Sitemap link. People often get these confused and this results in an error. NOTE: This XML sitemap URL is only for search engines so it’s not easily readable by humans, but Google can understand what it says and knows what to do with it. 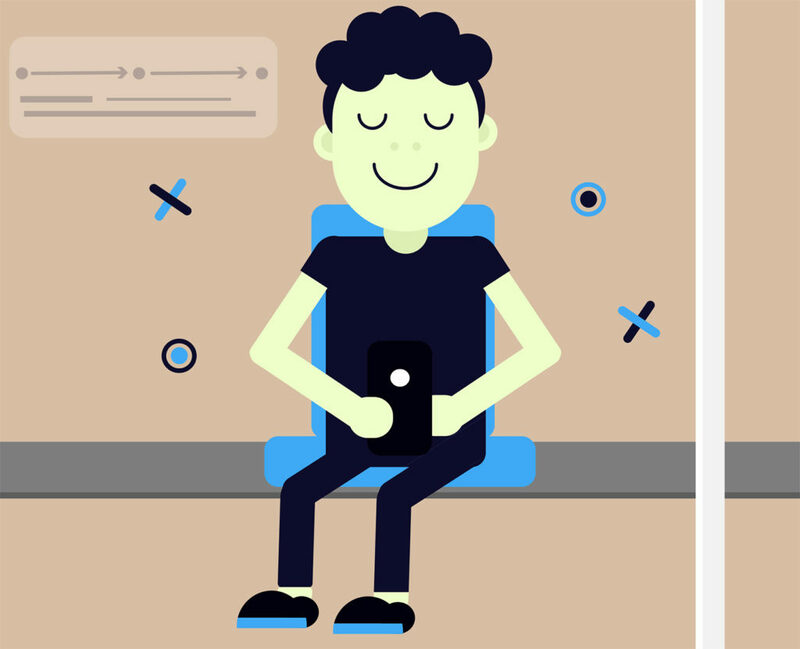 How Do I Improve My Mobile Friendliness?